Ballinderry will go into Sunday's All-Ireland Club Football Quarter-Final against London's Kingdom Kerry Gaels as huge favourites. The Shamrock ended a 12-year wait for a provincial title as they defeated Glenswilly 1-13 to 2-6 two weeks ago. According to Ballinderry manager, Martin McKinless, the Derry side know very little about Sunday's opposition. The Gaels include London star Lloyd Colfer but it's difficult to imagine anything other than a Ballinderry win. With the likes of Conor Nevin, Gareth McKinless, Michael McIver, Kevin McGuckin, James Conway, Ryan Bell, Conleith Gilligan and Colin Devlin all in tremendous form in recent matches, many pundits are predicting a comprehensive Ballinderry success. However, the Shamrock may not be inclined to go through all their gears in this game - particularly if the weather is poor at Ruislip. Judging by some reports from Ballinderry this week, the entire Lough Shore village will be decamping to the British capital this weekend with no doubt some taking the opportunity to indulge in some Christmas shopping. Such is the local community's passion for Gaelic Games, that the club had no difficulty in raising the funds for the players's transport by air. "The fundraising only began last week but within a week we had all the cost of the squad's travel all covered. It was a fantastic response. 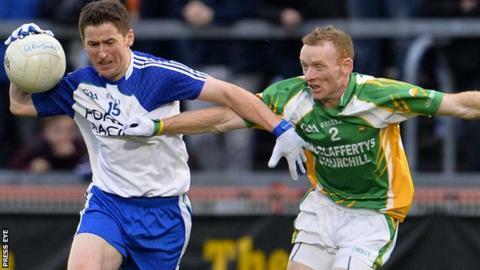 The whole community is behind us," said Ballinderry chairman Stephen McGeehan.